What are dental veneers? A veneer is a thin cover placed over the front of a tooth used to recreate the natural look of teeth. A veneer can also be crafted into a crown, or veneer crown. 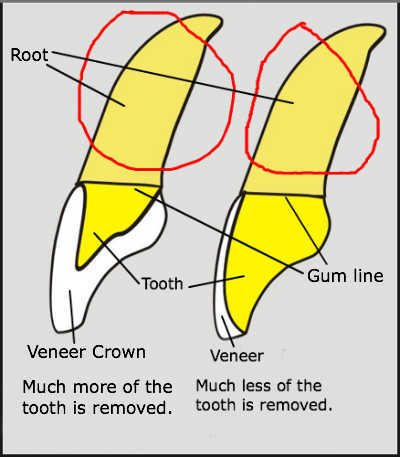 In this case, more of the tooth is removed, not just the surface on the front (see diagram above). What are they made from? Veneers are made from ceramic (porcelain) or composite (resin). What's the difference between the materials? Composite is softer, opaque, and porous. Ceramic is stronger, longer lasting, waterproof, and lifelike. Ceramic veneers are bonded to the tooth structure by etching the surfaces with a weak acid and then using modern dental adhesives (glues). This creates a very powerful bond. Composite veneers often start out as a resin-paste that the dentist mixes and light-cures into place. It's not as resilient as ceramic bonding. Ceramic veneers such as those made from lithium-discilicate (e.max is the most common brand name) may last over 20 years. How long does it take to get veneers? 1 day to 2 weeks, or more. Why's there so much difference in time? 1 day: some dentists have special equipment to craft veneers in their office. 1 - 2 weeks: Because veneers are placed on the front teeth and easily visible, most dentists work with an off-site dental lab and ceramist that specializes in cosmetic dental restorations to get you the best possible results. Over 2 weeks: In cases like these, the dentist may find oral health issues that need to be fixed before veneers can be installed successfully. How can I get great results? There are two steps needed to get the best possible aesthetic (look) and functional (oral health) results with your veneers. Make sure the dentist works with a dental lab and dental technician who also specializes in crafting cosmetic dental restorations. How much do veneers cost? $800 to $2,000 per tooth. Read this article about veneers cost and how to save money on them. Is veneer dentistry invasive? It does not have to be. However, each case is unique. Modern materials and techniques are driving toward minimally invasive veneer techniques. What's the difference between a traditional and a non-prep dental veneer? Non-prep veneers are even thinner than traditional veneers and less invasive, sometimes requiring no preperation (grinding) of the natural tooth. Here's more information and photos of a non-prep veneer case I crafted. Do veneers stain, how about teeth whitening? Composite veneers which are porous can stain and often change color over time. So be careful about drinking things like wine or smoking. Ceramic veneers, like porcelain dinnerware, is waterproof and keeps its original color better. The rule of thumb is get your natural teeth whitened first, then get your veneers to match your natural tooth color as best as possible. Do they chip? How do I maintain them? They can chip or the fall out due to heavy grinding biting into something hard like ice or sports accidents. Maintain and care for them as you would your natural teeth, this includes brushing and flossing to keep your mouth healthy. When should I consider getting veneers? If you're not happy with your smile, talk to your dentist and get a second opinion about your options. Veneers may be the answer. i.e. Veneers could easily close a gap between your front teeth. Maybe all you need is to whiten your teeth, not veneers. Or, perhaps you may need to straighten your teeth first before getting veneers. If you're looking for a dentist read this article to help you through the process. What should I know about bad veneers? Getting new veneers: Make sure you work with a competent dentist who will consider the form and function (oral health) along with the aesthetics (natural look) of your veneers. This will go long way in avoiding problems later. Fixing existing dental veneers gone bad: Go back to your dentist or get a second opinion. If you got veneers years ago, it's possible they need replacement with modern materials and techniques that look and function better. Show off Your New Veneers! Have you gotten a new smile with dental veneers? Tell us about it and share some pics (if you want). Aesthetic dentistry can be, and is, life changing. Why did you get it done? How did it change your life? What's happened since you got your new look? What have your friends and loved ones said about it? Would you recommend it to others? Why or why not? We want to know! **Aesthetic Dental Professionals**Feel free to show off too and share some patient testimonials, or videos/pictures of your 'master work'. Video: Paste a public embed code and we'll load it behind the scenes.